Hölzel designs and manufactures high-performance stamping dies. The entire project will be implemented at our own premises. As a result of our decade-long experience and our systematic measures of further development, the dies of Hölzel distinguish themselves by their high degree of reliability and their long service life. The modular design of the plug-in technology, the active elements manufactured from carbide and the fully integrated die monitoring systems are standard at Hölzel’s. 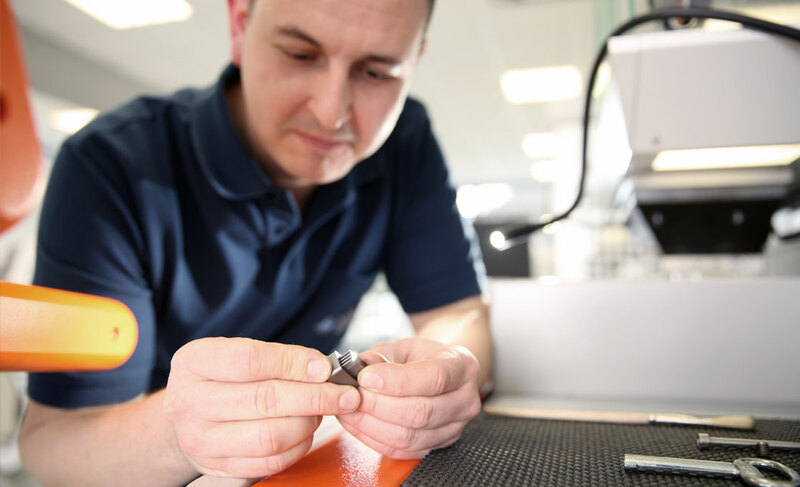 In case a smaller number of stamping parts is required, we can offer our customers Hölzel-owned universal dies, thus allowing the customer to benefit from Hölzel’s usual precision and quality at a reasonable price in relation to the number of parts produced. Hölzel will solve your most difficult problems in a reliable way, be it during the stage of project consulting, during die development or during prototype manufacturing. Promoting the trustful cooperation with our customers enjoys the highest priority, so that our customers can benefit indeed from Hölzel’s long-standing expertise.